Netflix television series "Black Mirror," Season 4. The brilliance of “Black Mirror” has always been right there in its title, an eerie evocation of what’s always staring back at us from our powered-down smart screens: namely, our own reflections, made opaque in the darkened glass and boxed-in by its borders. The more you think about it, the more unnerving that visual becomes, making it a suitable complement to Charlie Brooker’s speculative dystopian anthology, which — across its unsettling but uneven fourth series, on Netflix Friday — is far less afraid of technology than what it could do to a humanity eager to embrace it without care for the consequences. As such, it would be reductive to say that “Black Mirror” thinks tech is evil. The show generally depicts technology as the great enabler, an open door to moral and mortal compromise through which humanity can choose to step — or, more honestly, jump. Its thematic concerns over fast-moving scientific progress pale in comparison to its doubts that we can responsibly reckon with the shifts in our own societies they precipitate. In its new season, “Black Mirror” continues to trace these overarching anxieties by zeroing in on the question of control, or the lack thereof, in the digital age. The six new episodes share a fascination with collision courses: between autonomy and automation, access and independence, simulation and reality. They ponder whether one must inevitably come at the expense of the other, especially in futures where — among other feats of tech wizardry — people’s cloud-based selves can achieve consciousness in worlds they don’t control. At least four episodes (there’s an argument it’s five) examine the idea of involuntary entrapment, that we’ll end up imprisoned, perhaps literally, by the technology we’re so thoughtlessly normalizing. “USS Callister,” the best of the batch, explores this while unspooling like a classic “Star Trek” recalibrated for the Gamergate era. Boosted by stellar turns from leads Jesse Plemons and Cristin Milioti, it’s the season’s most unabashedly fun installment, a rollicking sci-fi yarn that doubles as a clever dissection of toxic masculinity granted virtual omniscience. Only “Hang the DJ” — about two singles (Georgina Campbell and Joe Cole, both sublime) whose connection through a futuristic dating app blossoms into a romance potentially at odds with its inflexible, Orwellian algorithm — tackles the season’s overriding ghosts-in-the-machine conceit with similar exuberance. It even goes a step further than “USS Callister,” trading in the show’s cynical presets for a story that skews winningly sanguine. Both feel like episodes Brooker only could have written after “San Junipero,” last season’s standout and Emmy-minted proof that “Black Mirror” needn’t prophesize doom to make worthwhile points. As in past years, this season soars highest when it looks for a beating heart in the darkness. What a pity, then, that Brooker still can’t stop twisting the knife. Four seasons in, his well-established love of darkly ironic third-act reveals feels like a weakness, reducing characters to one-note martyrs or monsters, stories to grimly moralizing parables. The middling “Arkangel” fixates on a controlling mother (Rosemarie DeWitt) who subverts her daughter’s independence by seeing literally through her eyes. “Crocodile” smuggles related ideas — surrounding what harm can result from messing around in someone else’s head — into a chilly thriller setup, but its nihilism is numbing. And “Metalhead” — a black-and-white thriller in which a woman (Maxine Peake) evades a killer robotic dog across a post-apocalyptic wasteland — is almost undone by its head-scratching denouement. Judging from the season’s scattershot execution, Brooker fares better charting new directions than he does falling into old habits. “Black Mirror” has evolved since its inception, but its creator seems, paradoxically, to fear that, sometimes to the point of regression. No episode indicates this better than finale “Black Museum,” a triptych of grisly vignettes tied to exhibits in a curio archive that’s riddled with needless callbacks to seasons past. It’s an ill-advised note to go out on, Brooker lazily announcing that his show’s stories exist — however impossibly — in a shared universe. Who asked? 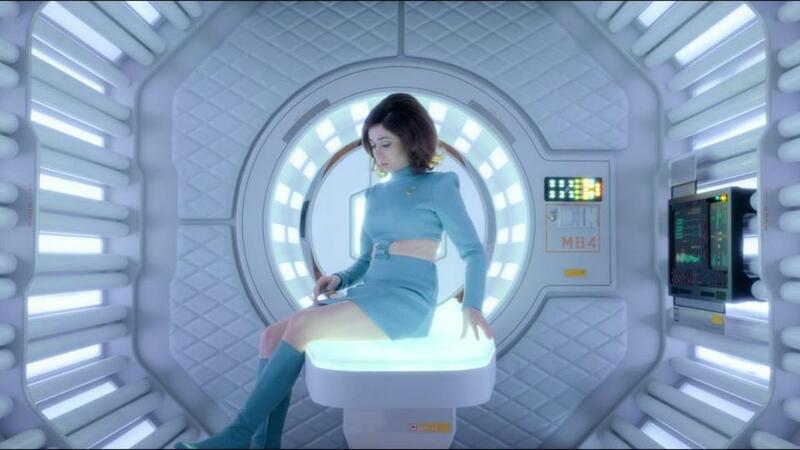 It’s precisely through throwing off the shackles of narrative continuity that “Black Mirror” has remained free to aim as high as it does. This year, its finest hours signaled their ambitions by daring to let some light into an often pitch-black drama — and pushing Brooker, prophet of doom though he is, to craft singular electric dreams capable of standing alongside (or is it against?) his standard techno-nightmares. On Netflix. Streams Friday. Isaac Feldberg can be reached at isaac.feldberg@globe.com, or on Twitter at @isaacfeldberg.